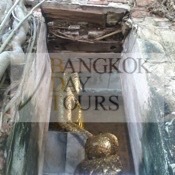 Wat Bang Kung, which dates back to the Ayutthaya Period, is one of the highlights of a visit to Ampawa. 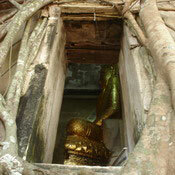 It is famous for the small chapel that is completely enclosed within the roots of a banyan tree called Bot Prok Po. 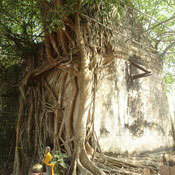 It is almost like the tree itself is the pillars of the temple. 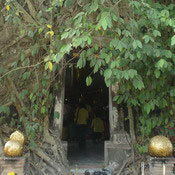 One famous temple in Bang Khonthi district is Bang Kung Temple. 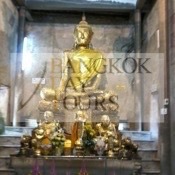 Within the temple there is an old ordination hall which houses a large sculptured Buddha image commonly called by villagers Luangpho Bot Noi. Mural paintings from the late Ayutthaya period depict Lord Buddha while he was sitting in the niche and preaching, flanked by the disciples paying respect to him. The temple is in the compound of Khai Bang Kung, a famous old Naval Forces Camp in Thai history, dating back to late Ayutthaya period. It was a location of great strategic importance where Thai and Chinese soldiers, under the leadership of King Taksin The Great, annihilated and repelled the invading Burmese army. This powerful camp was indeed feared by the Burmese. 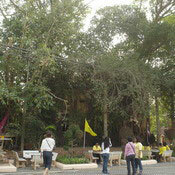 The Camp was left deserted for almost 200 years and then established as a Boy Scout camp in honour of King Taksin. They built a statue of the king to commemorate his historic deeds.